We hold rich expertise in successfully handling the demands of Bronze Casting Machines. These automatic precision casting machines are made available with swiveling barrel for delivering mid-sized shell, sand and solid shaped moulds. The systems offered are designed to allow melt treatment which aids in achieving better filling of moulds. Further, the machines also allow casting possibilities with vacuum and vacuum-pressure technology where the feeding is improved using strong post casting pressure. Further, the casting process is set & monitored using clear text display interface that allows better handling of the operations. 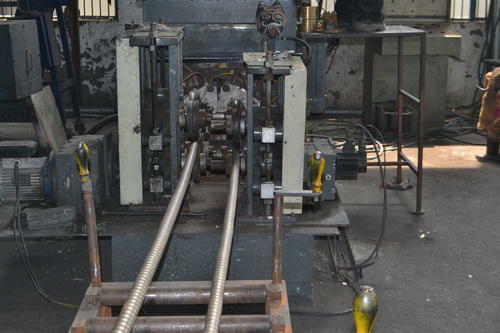 With controlled atmosphere reducing oxidation of metals, these machines are designed to cast bronze metal in a short time period in forms including panel, square bar, round rod, circular pipe as well as in other customized shapes and sizes. Further, the advanced technology based operations of the machines minimize surface imperfection as well as help in achieving effective mixing and in turn increasing the casting capacity with optimum end casting results. Here, the presence of precision functioning digital thermometric system also allows better control of metal during casting operations with its well defined security system ensuring maintenance of consistent casting operations and end delivery of quality casting products.